Color. By default, each track’s clips are drawn in a different color. The clip colors restart at the tenth track. You can customize the default colors of clips in Edit > Preferences > Customization - Color, or change the color of any individual clip in the Clip Inspector. Note: In audio clips, the waveform changes color, unless no clip contents are displayed. In MIDI clips, the clip background changes color. Name. You can also assign each clip a descriptive name, which is displayed in the upper-left corner of the clip. Contents. At your option, clips can be displayed with a graphical representation of the events in the clip. 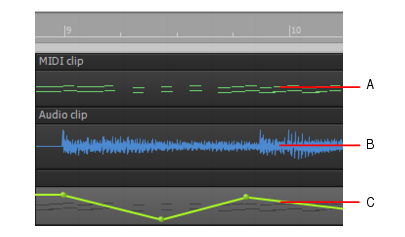 The effect is slightly different for MIDI and audio information. 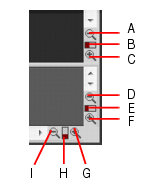 Audio and MIDI clips show various information at the top of each clip. A standard clip shows only the clip name, while clips that have been modified in various ways show additional information. Figure 125. Clip header indicators. Note: Clip headers automatically disappear if the track height is less than 36 pixels. The following table describes the various clip header indicators. The clip is a standard audio or MIDI clip. The clip is assigned to a clip group. The number identifies the group. For details, see Clip selection groups. The clip contains at least one clip effect. For details, see To insert an effect on a clip. The clip has AudioSnap enabled, which gives you flexible rhythmic and tempo control over audio transients. For details, see AudioSnap (Platinum and Professional only). The clip is a Region FX clip, which lets you perform pitch correction on notes and phrases, edit formants, and add vibrato to monophonic sounds. For details, see Using Region FX. The clip has been stretched from its original duration by the displayed percentage value. For details, see Slip-stretching audio. The clip follows the global project tempo. For details, see To sync an audio clip to the project tempo and AudioSnap section. Double-click the clip to open the Piano Roll view. For details, see The Piano Roll view. Double-click the clip to open the Step Sequencer view. For details, see Step Sequencer view. Double-click the clip to open the Staff view. For details, see The Staff view. Double-click the clip to open the Event List view. For details, see The Event List view. 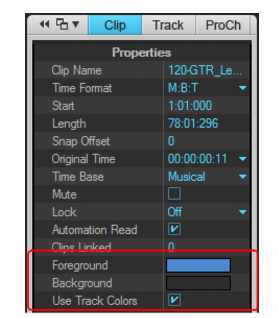 To globally hide the clip headers, click the Track view View menu, point to Display, and select Maximize Waveform Height. When this options is enabled, the waveform display spans the full height of clips. Click the horizontal zoom buttons to zoom in or out by a fixed percentage each time you click. Drag the horizontal zoom fader to zoom in or out by the amount you drag. Hold down the CTRL key and press the right arrow key (to zoom in) or the LEFT ARROW key (to zoom out). Point the mouse pointer at the top half of the Clips pane or Piano Roll view Time Ruler (the mouse pointer should look like this: ), then drag up/down. Click the vertical zoom buttons to zoom in or out by a fixed percentage each time you click. Drag the vertical zoom fader to zoom in or out by the amount you drag. Hold down the CTRL key and press the UP ARROW key (to zoom out) or the DOWN ARROW key (to zoom in). Point the mouse pointer at the top half of the Clips pane or Piano Roll view Time Ruler (the mouse pointer should look like this: ), then click with the right mouse button and drag up/down. Use the Zoom tool to drag-select an area of a clip or clips that you want to zoom to. To activate the Zoom tool, hold down the Z key. When you release the mouse, the area you selected expands to fill the Clips pane window. Hold down the ALT key and roll the mouse wheel forward to zoom in, backward to zoom out. Hold down ALT+SHIFT to intensify mouse wheel zoom effect. Click the Track view Options menu and choose Mouse Wheel Zoom Options. Select the intensity of the Zoom effect in Zoom Factor by using the spinners or manually entering a value. Select the vertical and horizontal Zoom focus. Check or uncheck Simultaneous Vertical and Horizontal Zoom. The default is for Simultaneous Vertical and Horizontal Zoom to be checked. If you uncheck it, Fast Zoom exhibits the following behaviors. Click the Track view View menu, point to Display and choose Display Clip Names to show clip names, or leave it unchecked to hide clip names. Click the Track view View menu, point to Display and choose Display Clip Contents to show clip contents, or leave it unchecked to hide clip content. SONAR modifies the clips pane to show the information you want. Select the clips you want to rename. Open the Clip Inspector and show the Properties section. Figure 126. The Clip Inspector. SONAR renames the selected clips. Note: To rename a clip in SONAR Home Studio, right-click the clip and select Rename Clip on the pop-up menu. Select the clips whose color you want to change. Figure 127. The Clip Inspector. Select the Use Track Colors check box. Click the Foreground or Background field and pick a color. SONAR changes the color of the selected clips.